The second in a series of events for the CSSD’s Reframing Gendered Violence project, the panel extended the discussions of an earlier talk in October, thanks to support from the Dean of the Humanities, the Columbia Global Centers, and the Henry Luce Foundation. Introducing the two speakers, Abu-Lughod complimented their shared ability to bridge the divide between scholarship and activism. 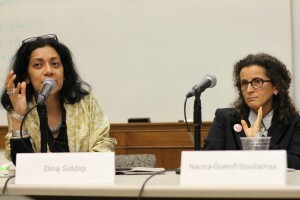 Dina Siddiqi, Professor of Anthropology, BRAC University, presenting on “Child Marriage and the Feminist Imagination,” attested to the struggle feminists in the developing world face as they grapple with forces competing with any commitments to local contexts and concerns. “How do progressive feminists in a place like Bangladesh—deeply transnational yet geopolitically marginal—negotiate the complexities of neoliberal donor and corporate agendas, developmentalist state imperatives, geopolitical securitization frames, and calls to global feminist unity?” said Siddiqi. “What kind of agency is possible when feminism itself has been governmentalized?” she challenged her listeners. Nacira Guénif-Souilamas, Professor of Education Sciences, University of Paris 8 Vincennes-Saint-Denis, approached the question of religion and gender violence through the problem of foundational inequality in French and European polities. The event concluded with a lively Q & A that featured questions on topics ranging from the future of neoliberalism to laïcite and the banning of the veil in French schools to the framing of critical feminism. Video from the November 3rd event is available here and video from the October 13th event here.